Local Greenpeace volunteers in South-West London, return pieces of single use packaging from Sainsbury’s to the store manager, February 2019. Greenpeace launches campaign challenging supermarket giant Sainsbury’s to clean up its act on tackling plastic waste. 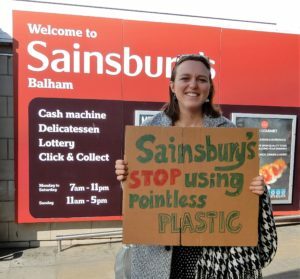 Sainsbury’s was ranked in last place in a survey of supermarket plastic policies by Greenpeace last year and has made the least progress. Sainsbury’s pledged to cut 77 tonnes of plastics, while competitors cut thousands of tonnes from their plastic footprint. SAINSBURY’S is the worst in class of all major UK supermarkets for cutting plastic packaging, Greenpeace analysis shows today. The UK’s second biggest supermarket is the target of a new campaign by Greenpeace, after it came last in a 2018 survey  of supermarket plastic policies and was found to have made the least progress on plastics reduction since January last year. The organisation is calling for Sainsbury’s to set yearly plastic reduction targets, and start by eliminating unnecessary and unrecyclable plastic by 2020. Elena Polisano, ocean plastics campaigner at Greenpeace UK, said: “Sainsbury’s knows that plastics pollute our oceans and harm wildlife. They know that customers care about cutting plastic. And they know their competitors have outdone them on plastics reductions measures. But they remain worst in class. Greenpeace looked at publicly available plastics pledges from the top 10 UK supermarkets since January 2018 and found Sainsbury’s was the worst performer. Sainsbury’s promised to cut just 77 tonnes of plastic packaging, while Asda achieved 6,500 tonnes of reductions. Sainsbury’s published no information about the number of units of plastics cut, while Marks and Spencer and Co-op both reduced their output by more than 500m units. For those which announced how many tonnes of plastics would be cut, the average reduction was 2,217 tonnes – Sainsbury’s pledged to cut just 77 tonnes. For those which announced how many units of plastics would be cut, the average reduction was 266.3m units. Sainsbury’s did not publish how many units of plastic it cut. On average nine plastics pledges had been made, while Sainsbury’s announced just five new measures on plastics. Despite plastic production being set to quadruple by 2050, retailers are still focusing more on recycling than reduction. Most major supermarkets including Sainsbury’s have committed to eliminate non-recyclable plastic packaging by as late as 2025 as part of the UK Plastics Pact, and the voluntary targets do not necessarily entail an overall plastics reduction. Many retailers have additional targets to eliminate problematic plastics such as PVC, expanded polystyrene and black plastic within the next two years – but not Sainsbury’s. Every year the top 10 UK supermarkets place over 800,000 tonnes  of single-use plastic packaging on the market, so Greenpeace UK is campaigning for concrete action now. Since January 2018 Sainsbury’s had pledged to remove plastic wrapping on greetings cards, with a deadline of Monday April 1 this year . It removed plastic cups and cutlery from its head office; reduced the amount of plastics in some food cartons, and it sells cauliflowers and some bananas loose . It offers a discount on hot drinks for customers using reusable cups . Tesco also performed badly – introducing just six measures over the same time period. Tesco hadn’t published how many tonnes of reductions it aimed to achieve, but this week announced a trial of selling 45 lines of fruit and veg loose . It is phasing out 1m plastic straws from its cafes, and will this year be the first to trial refillable packaging through the Loop scheme. More than 922,000 people have signed Greenpeace’s petition calling for UK supermarkets to ditch throwaway plastic packaging. Sign the petition here. Greenpeace assessed information publicly available on plastics reduction between January 2018 and 27/03/19. Information relating to recycling, and to clothing retail is not included. A 2018 survey of supermarket customers found nine out of 10 people (89%) are concerned about ocean plastic pollution. Levels of concern over the issue have skyrocketed over the past 12 months, with two-thirds of people (67%) saying they are more concerned about ocean plastic than they were a year ago. Around one-third (32%) have maintained their level of concern, and just 1% of the public is less concerned than this time last year. Checking Out on Plastics: A Survey of UK Supermarkets’ Plastic Habits, Greenpeace UK and the Environmental Investigation Agency, 2018.